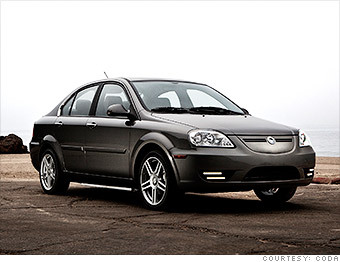 Among 2013 model year cars, these 10 cost the least to drive down the road. Getting just 73 MPGe, the Coda is relatively inefficient compared to other fully electric cars. That's why it ties with the Toyota Prius Plug-in, even though that car goes just 11 miles on battery power before running on gasoline. We ranked the Coda higher than the Prius here because electricity costs less, per mile, than gasoline and the Coda uses no gasoline.